Cyprus Property Blog by Cleo : Price Reduced on Apartment in Kato Paphos - Walk to the Beach - 65,000 Euros - NOW SOLD! • 55 sq. 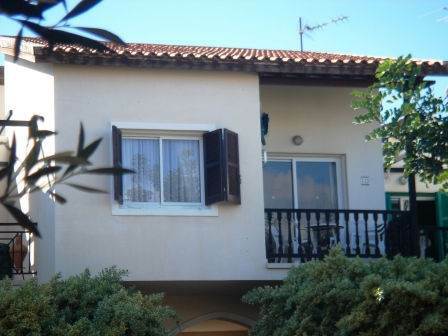 m., 1 bath, 1 bdrm apartment "with Club House" - €65,000 EUR - Full Title Deeds - NOW SOLD! Kato Paphos, Cyprus - This well maintained top floor apartment is located in the heart of Kato Paphos within easy walking distance from a variety of restaurants/tavernas, cafe's, clubs and pubs. The beach is 3 minute walk away, with the recently renovated sea front harbour area nearby. The property features an entrance hallway, off which is a large double bedroom with fitted wardrobes and a modern bathroom with vanity unit and heated towel rail. The open plan lounge, dining area and kitchen is spacious, and patio doors from the lounge lead on to a balcony overlooking an attractive piazza with water fountain and mature gardens. The dining room table easily folds into a small coffee table, transforming this area into a second sleeping area. The communal pool area,set in attractive mature gardens, has a clubhouse open in the summer months, and there is plenty of parking nearby. This property is ideal as a holiday home or rental investment. Superb for those wanting to holiday near all the amenities without needing a car.